The tarot card stagnancy symbolizes to be in the predicament – fixed in an inevitable dilemma. 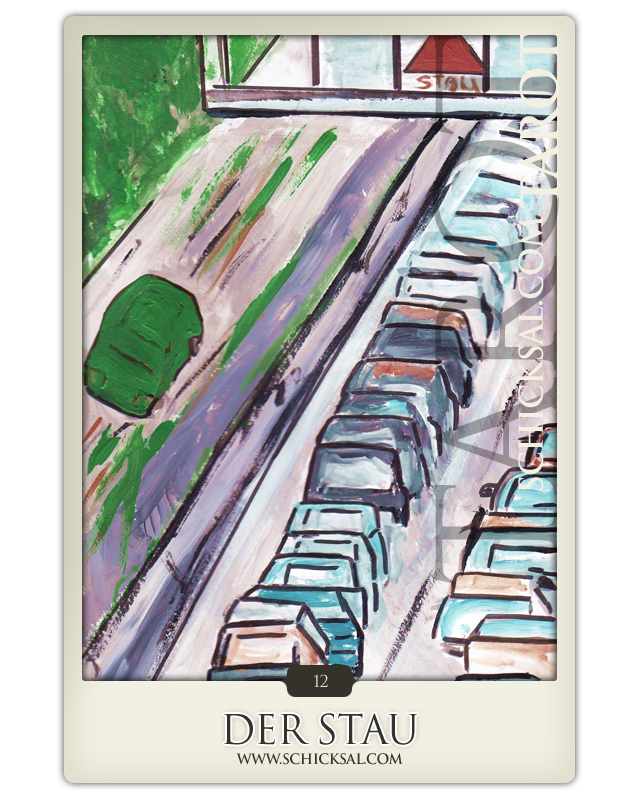 The 12th card of the great arkana shows a special situation of daily life: traffic congestion. The roads are congested and nothing works anymore. Every single car is blocked mostly by one another. But the oncoming carriageway is open. The tarot card stagnancy symbolizes to be in the predicament – fixed in an inevitable dilemma. Nothing really works and there is no way out – you feel like a hanged man, who can do nothing in his absolutely hopeless situation. He is condemned to passivity and is forced to have patience – and this patience it is a hard test. But this compulsory break is needed. So it offers the opportunity to come to know to significant experiences. By the way – the way it works at that moment it cannot stand. The tarot card stagnancy impacts the request to think about your recent situation and stop the permanent track. Maybe there was made a grave mistake until now. Maybe it is the time to change the track immediately. It is the moment to draw a conclusion towards attitudes, thoughts and conceptions of your present and previous life. This card offers to clear a path into new and unknown territories. Reversal, turning back, turning point, changed point of view, reflection, to pause – to make up your mind to change your recent life and situation. It looks like red traffic light switches to green man. The roads are always open! The negative side of the tarot card stagnancy is to be unreasonable towards the compulsory break – there is no acceptance. On the contrary it starts a fight against the signs of the times. But in this case there is a loss of energy and deliberateness. By the way it could happen then to feel frustrated, unhappy and blind towards the real situation in which you are in at the moment. If you act to the contrary you could tend to blind and selfish excessive desire for action. Apathy and self-abandonenmt could be a result as well. Love – as well there is the time to think over and maybe it is the time for a change. Partially or completely – it is up to you. Your recent relationship and love life feel stranded and you are not happy and satisfied with it. Maybe there are some wrong imaginations or values in your mind and you missed the point to act right on time. Maybe you keep to illusions – far away from the path of reality – however - now the time has come to change something and it is up to you to find the direction of the track right now. Your professional life looks like you are stranded: you are in a real life fix. Stagnancy and stagnation in your professional life – a compulsory break. You are not satisfied with that situation and you want to change. You sense still to be in the wrong track, a dilemma without solution. It is to be used as a changing point in life, a turning point towards your attitudes and perspective. Now it is the time to improve your mistakes on the past and start anew and create a new desirable situation. Think about it – think over your situation and try to change your life. To inhibit mental development or being uncontrolled are negative reactions to disregard the signs. Self –abandonment, unreasonableness. Stagnancy as daily card shows a blockade and stagnancy. Pay patience and take your time to rest within a while. There is no special point to turn or leave the trace behind. Accept this phase as a period of an interruption of your standard and rules. Maybe there are some grave mistakes on the past that have to be left. The change is a turning point in your life and now it is time for a change.